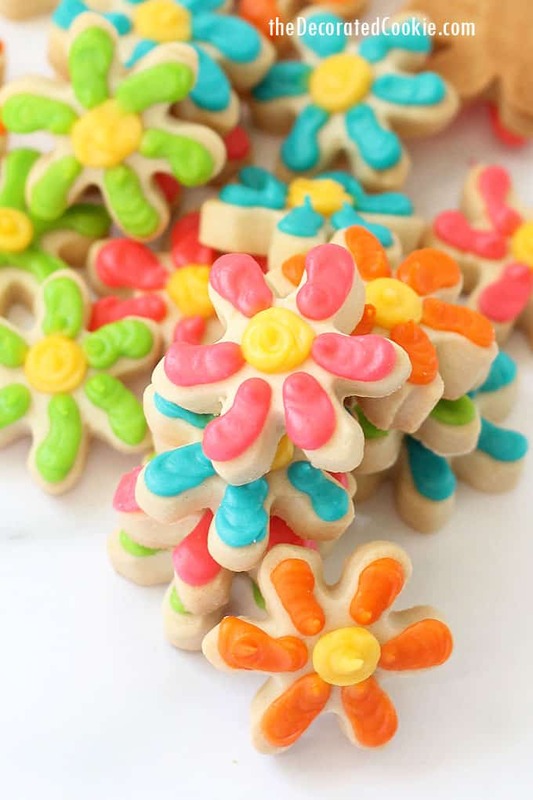 Cute colorful mini daisy cookies from a mini snowflake cookie cutter. 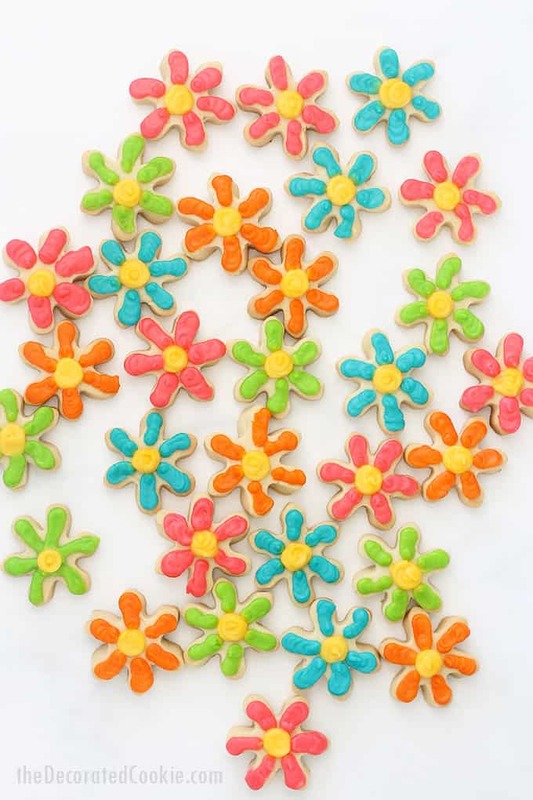 These colorful mini daisy cookies are a perfect treat to make and give this spring. 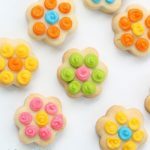 Daisy cookies are no stranger to this blog. 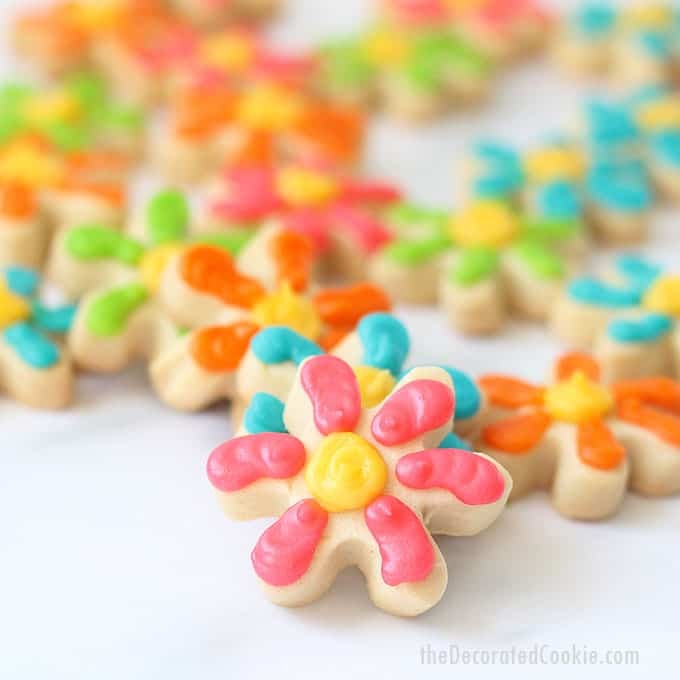 Check out these easy polka dot daisy cookies, or these daisy cookies in a jar. 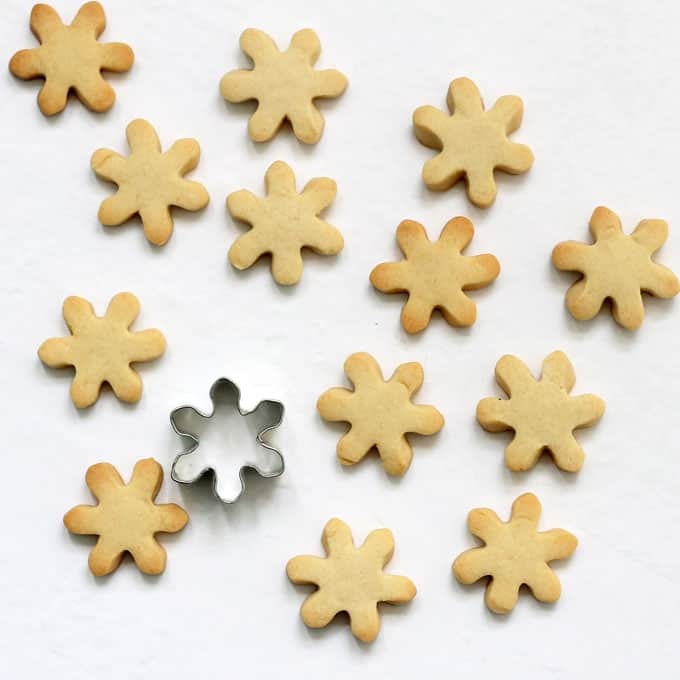 Here, I’m making more of a gerbera daisy, by using a tiny snowflake cookie cutter. 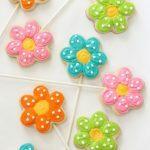 Need a homemade gift idea for Mother’s Day or a spring birthday? 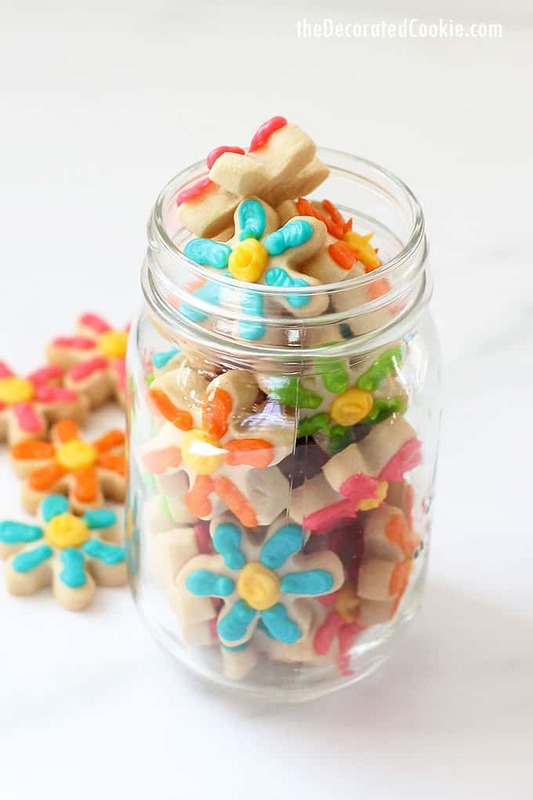 Package the cookies in a mason jar. 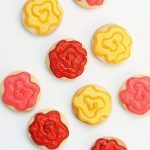 You can even ship these cookies. Here, I fit as many as possible in the mason jar. I placed a crumpled up piece of wax paper at the top before adding the lid, just to be sure there was no movement in the jar. 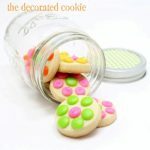 Wrap the jar well in bubble wrap and package to ship. Tuck popcorn or kraft paper in any empty space in the box. The key to shipping without breakage is to be sure there is no movement in the box. Shake the closed box to be sure you don’t hear any shifting. *Find the supplies above at the craft store. For food coloring, I used Electric Orange, Electric Pink, Electric Green, Egg Yellow, and Sky Blue. Prepare the cookie dough according to the recipe, chill it, roll it out, cut out snowflakes, bake, and let cool. Prepare the royal icing according to the recipe, divide it, prepare decorating bags with couplers and tips, fill, and tie close with rubber bands. 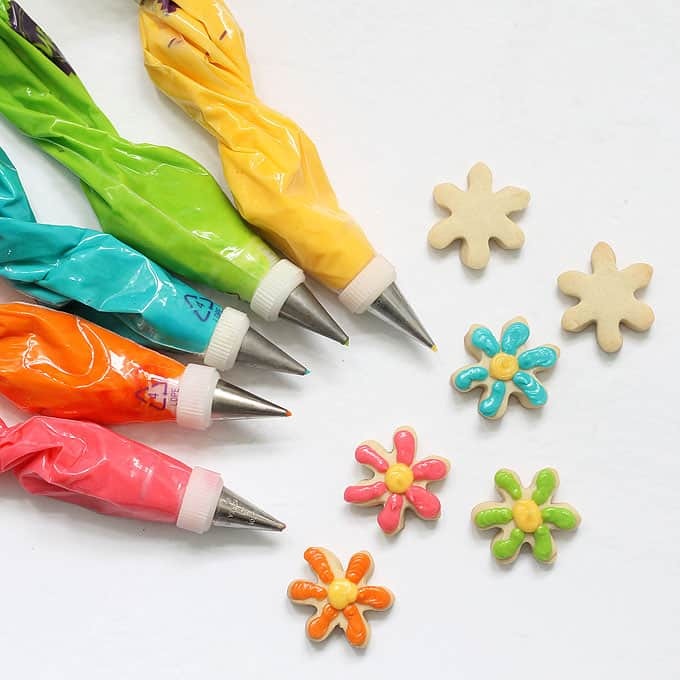 To decorate the cookies, pipe yellow centers. Then pipe the petals, starting from the outside, squeezing a dot, and pulling to the center. 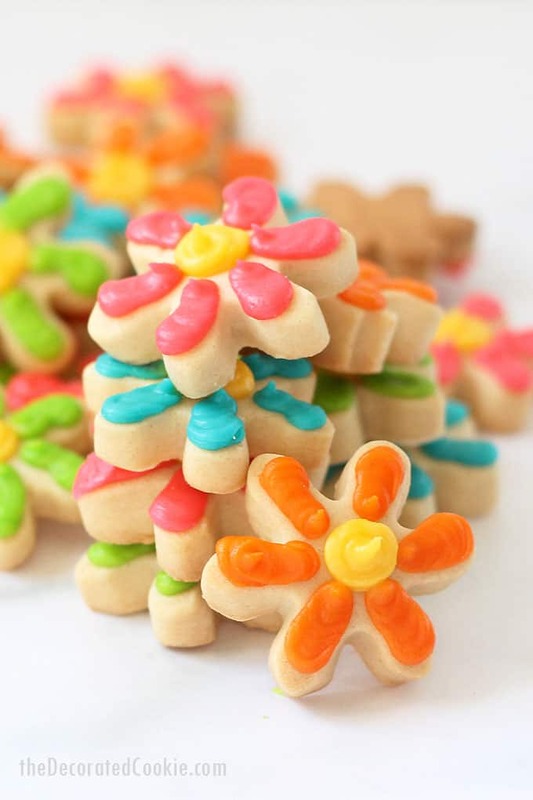 Let the cookies dry overnight before handling and packaging.